It’s been a while since I’ve shared some of my photo adventures and there have been several memorable trips out in the field this past summer. Sometimes it’s right in the woods around my home and others happen a bit farther afield. The young of many birds have fledged and are making their way into the world. Whether they are following their parents or striking out on their own, it offers lots of opportunities to observe and photograph them. And sometimes, I’m in the right place, at the right time… and just happen to have my camera on hand, which is what happened with this eagle photo. It’s not everyday that I see an eagle fishing along the Ammonoosuc river! And I’ve been making regular visits to various ponds in search of loons this summer. Had a bit of luck in that regard too! 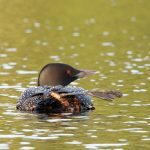 Found pairs of loons nesting on a couple of ponds and was able to take some wonderful photos. Didn’t get any photos of young loons this year but maybe on next summer’s photo adventure! 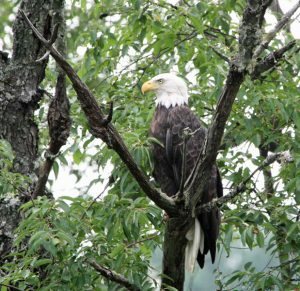 This entry was posted in Photo Trips In The Wild and tagged american bald eagle, bird art, common loon, Franconia Notch, loon art, NH Artist, white mountain artist, Yellow-bellied Sapsucker. Bookmark the permalink.